For courses in C++ Programming. 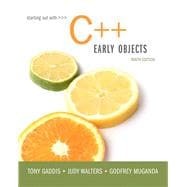 Intended for use in a two-term, three-term, or accelerated one-term C++ programming sequence, this Ninth Edition of Starting Out with C++: Early Objects introduces the fundamentals of C++ to novices and experienced programmers alike. In clear, easy-to-understand terms, the text introduces all of the necessary topics for beginning C++ programmers. Real-world examples allow readers to apply their knowledge in understanding how, why, and when to implement the features of C++. The text is organized in a progressive, step-by-step fashion that allows for flexibility. Building on the popularity of previous editions, the Ninth Edition has been updated and enhanced with new material, including C++11 topics and recent changes in technology. Tony Gaddis is the principal author of the Starting Out With series of textbooks. He is a highly acclaimed instructor with two decades of experience teaching computer science courses, primarily at Haywood Community College. Tony was previously selected as the North Carolina Community College “Teacher of the Year” and has received the Teaching Excellence award from the National Institute for Staff and Organizational Development. The Starting Out With series includes introductory textbooks covering Programming Logic and Design, C++, Java™, Microsoft® Visual Basic®, Microsoft® C#, Python, App Inventor, and Alice, all published by Pearson. Judy Walters is an Associate Professor of Computer Science at North Central College in Naperville, Illinois, where she teaches courses in both Computer Science and Media Studies. She is also very involved with International Programs at her college and has spent three semesters teaching in Costa Rica, where she hopes to retire some day. Godfrey Muganda is a Professor of Computer Science at North Central College. He teaches a wide variety of courses at both the undergraduate and graduate levels, including courses in Algorithms, Computer Organization, Web Applications, and Web Services.